Australian underground riff kings Hobo Magic are back and off to a flyer with the first single drop off their soon-to-be-released second album. After studio-crafting the songs and exploring a more progressive and melodic side of the Hobo Magic soundscape on the next album overall, the new single 'Sonic Sword' could be seen as the punchiest and most 'straight down the line' track on the new release. The track encapsulates the backbone of lyrical content that carries on through previous releases but of a more personal nature, conveying messages of living a life free from the constant worry and wanting of money and material possessions, open mindedness and acceptance of the difference of others. 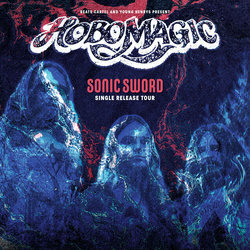 Hobo Magic accompany the 'Sonic Sword' single release with a 14 date East Coast tour, stopping in at venues throughout QLD, NSW, VIC and TAS for the first time, also lining up with scene-creating bands such as Tumbleweed and King Parrot. The Psych Rock Trio have cemented themselves as underground scene leaders around the country, pulling crowds of 2-300 per gig despite not having the full support of Australia's largest radio station.